Campaigning for Jeremy Corbyn isn't enough. The Labour Party must be transformed into a vehicle of popular democracy. It would be easy to feel a sense of frustration at recent events in the Labour Party. The coup against Jeremy Corbyn’s leadership has been a gift to the Tories: distracting from their own divisions, papering over the recession they have likely triggered, and allowing them to open up a significant lead in the polls. But it was also an inevitability. Corbyn’s election as leader last September was a symptom of a broader crisis in British politics. His victory was never accepted by MPs who still believed they could restore the old order. What is now playing out in the Labour Party is a pivotal battle between a 1990s politics that is dying and a post-2008 politics that is struggling to be born. Two upcoming events — August’s leadership election and September’s party conference — provide Labour members with a crucial opportunity. It won’t be enough to campaign for Corbyn to hold onto the leadership. If Labour is to build a future for left-wing politics in Britain, it must be transformed into a vehicle of popular democracy. When the Labour Party last unseated a Tory government in 1997, it was responding to a distinct political moment. Instead what was needed was a professional politics. Under Blair’s modernizing project, political parties would cease to be mass organizations with roots in civil society and become elite cliques designed to efficiently administer government. While economic growth continued, this model could build a social majority. Won over by the spirit of the times, few people objected to politics being hollowed out: at first, there appeared to be relatively little cost to letting technocrats make all the decisions. The 2008 economic crisis, however, exposed this fallacy. A political system designed to insulate decision-making from popular pressure has proven incapable of responding to growing dissatisfaction, and is instead beginning to buckle under the strain. Its designers, who once claimed the title of modernizers, today resemble dinosaurs. The Third Way is running out of road. In its place is emerging a new politics of social conflict. The initial public response of “anti-politics” has begun to turn decisively towards re-engagement. Last year saw the most protests in Britain for decades. After years of falling living standards, many who had once believed that public affairs could be left to the political elite are now demanding more control over their lives. There can be few more dramatic expressions of this than the explosion in Labour Party membership to six hundred thousand, making it the first mass party in the Western world this century. But Labour is not the only party seeing a significant growth: the Scottish National Party, UKIP, and the Greens also saw an influx of members as each in their own way became repositories of anti-establishment sentiment. The seeming impossibility of resolving problems by individual action is causing the return of mass politics. Corbyn’s victory in September was a product of this shifting terrain. Realizing its potential, however, will require a deeper transformation than retaining the leadership. If Labour is to become a party that can win victories for left-wing politics in the twenty-first century it will need to capture a political zeitgeist. As inequality deepens, and the British economy continues to stagnate, the prospects for professional politics will likely worsen. Rather than contenting itself with being the left-wing of a broken system, Labour should seek to challenge it by using its new mass membership as a basis for a new, representative politics. To achieve this, Jeremy Corbyn’s supporters should use the coming months to win a mandate for four key reforms: party democracy, movement politics, responsive policy-making, and real representation. Changes in party democracy must begin with how Labour receives its new members. Rather than treating them suspiciously, disenfranchising them, and subjecting them to a compliance unit, the party should instead establish a membership engagement office. This should be an interactive body, designed to inform new and existing members about party structures and involve them in local campaigns. It should also consider criticisms made about the antiquated local structures many of these members will first encounter, and produce regular reports outlining potential reforms. The party will also need to leverage new technologies to improve popular participation. There is no excuse for maintaining old hierarchies that monopolize decision-making in a few hands when an app can be designed to give hundreds of thousands a regular say in party affairs. If Labour can embrace a more active vision of politics, in which democratic participation is a constant process rather than an occassional interval, it will also find itself better placed to meet the challenges of today’s capitalism. The decline in the power of the nation-state means that governments cannot challenge international capital alone. Any meaningful reforms will have to be won not only in parliament but on the ground by social movements and reinvigorated trade unions. The policy-making process must also be updated. For a party program to be effective those whose needs it represents must feel a sense of ownership over it and fight for its realization. In order to achieve this, it must respond directly to popular demands. The technocratic vision of policy solves problems for people from a distance is dead, it must be replaced by one that aims to articulate and make possible demands which arise from below. Disbanding Tony Blair’s National Policy Forum would be a concrete step in this direction. Blair’s former adviser John McTernan recently wrote that the forum was designed to prevent a Labour government from being “trashed” by its membership, and glowed at how it had managed to prevent disunity when the party leadership supported the disastrous Iraq War. Clearly, a body that intends to neuter rather than represent its membership’s wishes is incompatible with the form of politics the present moment demands. The National Policy Forum should be replaced by a mechanism with the opposite aim — to bring to reality the wishes of party conference. 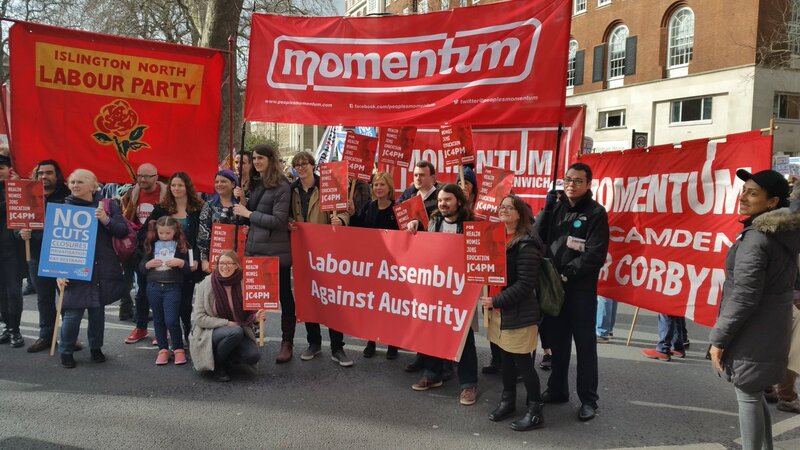 In building this party of popular democracy to confront the increasing power of organized wealth, Labour members will encounter a major obstacle: the entrenched opposition of the Parliamentary Labour Party. Distinctions matter here, and are too rarely applied. Many of the 172 MPs who voted no confidence in Jeremy Corbyn are social democrats who can, and must, be won over to a clear vision of left-wing politics in the twenty-first century. But a significant minority of the PLP will not accept a truly democratic Labour Party. And they have good reason: it poses an existential threat to the system they entered politics to protect. Unlike the other Labour Party factions — socialists and social democrats, who agree that the economic and political system needs renovation — these MPs embrace the parameters of the existing order and aim simply to govern it. As Tristram Hunt made clear, their goal is to restore Labour to a party of the 1 percent. But what if, instead, Labour ended the production line of cookie-cutter politicians who believe their Oxbridge education and friendships with the wealthy give them a right to govern? What if the party selected MPs who represented the real Britain of 2016? It could put in parliament people with experience of zero-hour contracts or who have struggled to pay the rent. It could challenge the under-representation of ethnic minorities and immigrants in politics, empowering those who have to deal with an increasingly hostile post-Brexit Britain. The party could be a platform for more progressive women — both a younger generation who have fought in the resurgent feminist movement and an older one that understands what it means to live with decades of unequal pay and one of Europe’s worst maternity systems. This transparent stitch-up demonstrates that the party establishment understands just how much is at stake in the mandatory reselection battle. However, party members organizing to bring about this change also have important allies — most notably Unite the union, who endorsed the measure at their recent conference. This is particularly important because Unite has been responsible for training some of the best new MPs in the party such as Rebecca Long-Bailey, Cat Smith. and Kate Osamor through its future candidates program. For Labour to embrace a truly representative form of politics, schemes like this will be needed to equip a new generation of activist-politicians with the skills necessary to give a voice to working people. Such transformations in the party might seem like an uphill battle, but the reason for fighting is simple: Labour cannot win if it keeps playing the old game. Social-democratic parties that have stubbornly refused to break from their past practices, that have aimed to win elections by merely interpreting the terrain and not changing it, have suffered huge electoral setbacks. Germany’s Social Democratic Party (SPD) has fallen from 34 to 23 percent of the vote; France’s Socialist Party (PS) from 37 to 23 percent; and Spain’s Socialist Workers’ Party (PSOE) from 43 to 23 percent. If it attempts such a narrow change, the recent move to the left will result in lost votes to the Liberal Democrats and the Tories. Equally, deposing Corbyn will encourage Scottish independence, risk an SNP-style meltdown in Wales, and cede ground to the Greens in England. There is no technical fix to this crisis, but there is opportunity in it. If Labour practices a politics that is genuinely representative when so few feel adequately represented it could lead a resuscitation of democracy. It could prevent deep insecurities about a changing world from translating into fear and xenophobia, and challenge the social atomization that has characterized recent decades. It could, with legitimacy, pursue a strategy to define itself as the party of lived experience in today’s Britain against the cold and calculating Tories. If it rises to the challenge, the Labour Party can not only imagine winning elections again, it can begin to close the chapter on Thatcherism in the place where it was written. Campaigning for Jeremy Corbyn isn’t enough. The Labour Party must be transformed into a vehicle of popular democracy.